The Cadence and MathWorks integration simplifies the exchange of data, boosts analytics capabilities, and shortens PCB design cycles. The collaboration of two key IC and PCB design solutions to the world’s leading MathWorks modeling tool allows you to focus on your full system design using a unique design flow from system through chip implementation and verification. Take advantage of existing MATLAB scripts and seamlessly share data between the Virtuoso and MATLAB platforms, allowing for data mining and efficient analysis in either platform, improving your time to market. Utilize MATLAB’s toolboxes and language to easily create and solve complex data calculations that would have previously taken hours to solve using expert coding knowledge and low-level APIs. This data analysis can be performed in either tool, or split between the two, allowing you to pick the most efficient manner to get the calculations and answers. Seamlessly integrating proven Cadence PSpice® technology with industry-leading MATLAB and Simulink products from MathWorks, the PSpice SLPS interface allows co-simulation of electrical and mechanical systems, making it easier to detect critical issues early in the design cycle. When combined with the stress analysis capabilities of the new PSpice Smoke analysis option, the reliability of designs can be analyzed and improved earlier in the design cycle. Learn about the design of a mixed-signal RF chain using Mathworks and Cadence tools in combination. 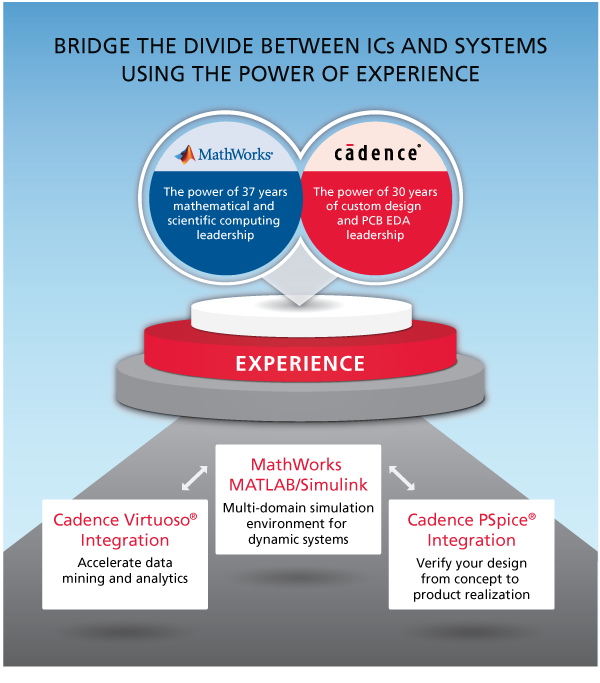 This webinar examines the integration of Cadence PSpice with MathWorks MATLAB and Simulink.